Last Spring, I was so excited to sign the twins up for some summer activities. They didn’t do any formal activities in the Winter because I was still scared of the Flu and RSV. 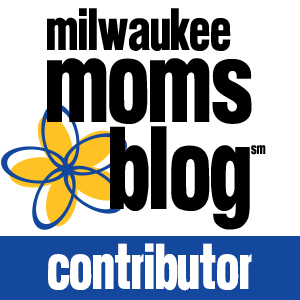 While getting sick is not a huge factor to a lot of parents when signing their kids up for activities, Preemie moms (or maybe just me,) still get really worried that something will send their kids back to the hospital. After talking with my parents (you need one parent per child, so I would need help) we decided on Swimming Lessons and Tumbling Lessons. I just want to point out that it’s hard for us parents of multiples to take classes unless we have help. 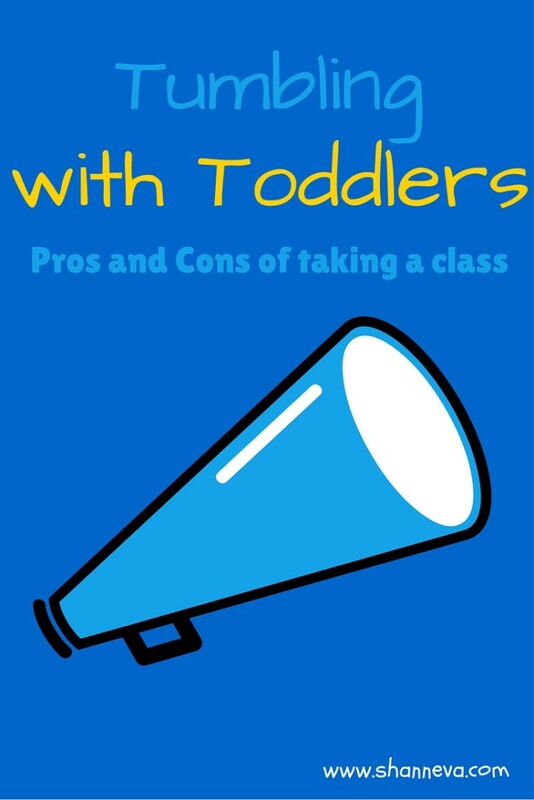 Most toddler classes require one adult per child. I’m very lucky that we had our babysitter help during swimming, along with my parents, who also helped with the tumbling. I completely understand why an adult is needed, but it can really prevent parents of multiples from doing these kinds of things. I’m not sure what the solution is, but I’m going to keep thinking on it. Anyways, we had an awesome time in Swimming (which you can read about HERE,) in July, then it was time for Tumbling at the gym at the beginning of August. Both lessons were through our Park and Recreation Department, but we had very different experiences with each. Swimming was wonderful. Our teacher was engaging, we sang songs, played in the water, learned some skills, and the twins got very comfortable in the water. Tumbling was not my favorite. Actually, I was very, VERY happy when it was over last Friday. 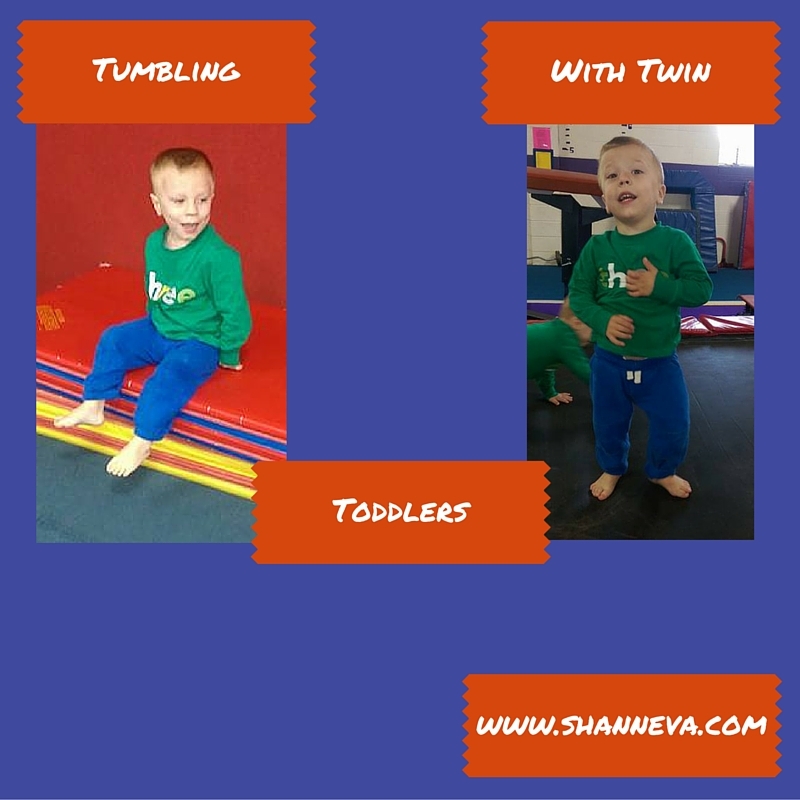 Not all of it was bad, so let me start with the good things about taking my twin toddlers to tumbling. #1 For the most part THEY enjoyed it. The first day we had some crying because I made the mistake of taking them to the playroom first. The lessons took place at a gymnastics studio that I wasn’t familiar with, so we got there early. We checked out the whole place, then I thought we would kill time by playing for a few minutes. All I have to say is there was ONE train to play with and TWO toddlers. Yet, the whole class, they still wanted to go back and fight over it the whole time. After that, we ignored the playroom completely, and they seemed to have fun most of the time in class. They weren’t doing what they were supposed to be doing, but they were having fun. I’ll get to explaining that in a minute. And I’m saying all of us got exercise! Between lifting them up while bouncing on the trampoline, to chasing them off the big kids mat, to running in circles with them, we all got a workout. It didn’t lead to great eating and naps like swimming, but I know they got some energy out. Really, it was only my big guy that was afraid of trampolines before the class. Now, they run and jump on them like old pros. No fear at all. Now, before I get to the not so good stuff, I would like to say a couple of things. First, my oldest son also took a class right after the twins, and loved it. He learned a ton, listened really well to the teacher, and wants to take lessons again next summer. Second, I had a really different idea of what kind of class I was signing them up for. When I thought back to the tumbling classes I used to take when I was little, we were in the gym of a high school. We learned somersaults, played with a parachute, and did really simple stuff. I figured this class would be similar to their swimming in that we’d sing songs, do simple skills, and just get them used to being in a class setting. That was not exactly what happened. Here are the reasons we will NOT be taking another tumbling class like this one next summer…or any other time. The class took place in an actual gymnasium that holds classes and has a gymnastics team. The Park and Recreation Department had some sort of deal so our classes were taken there and taught by their staff. I’m not sure if all gyms are like this (yes, I’m sure they are not,) but it smelled terrible when we walked in. Obviously, all the gymnasts must take off their shoes and socks to do all their activities, but the smell was overwhelming. It was apparent not much cleaning went on there…if at all. There was dust all over the place…and not just chalk dust from the gymnasts hands. Actual dust dust. Basically, I had to wipe down everyone and strip their clothes everyday after class. My laundry is still piled up from the last two weeks. Ugh. Listen, I realize you may be busy and we are not a priority since we’re not training for the Olympics, but you should really at least be pleasant when greeting new students. I later found out this man was also the owner. Our actual teacher was nice enough, but she didn’t really seem interested in being there. She had three of her own children wandering around, and most of the time she made her older two girls demonstrate the activities, while she was busy talking to someone or just standing around. Every once in a while, she would throw out a “good job,” just so we knew she was still there. On two of the days of the class we had a substitute teacher. She was a young college student, and she was wonderful. She paid attention to the twins, she participated in all activities, and made things fun. For example, when they started on the trampoline she drew them each a star with chalk with their initial for them to jump on. They loved it. If only we could have had her teach the whole time. Each class we started on the long, runway-type trampoline. The twins like bouncing on it, and even better was running down it and jumping onto the big squishy mat at the end. All of those things would have been perfectly fine. However, she wanted them to jump certain ways…knees to your chest, legs apart and together, drop down to your bottom and jump up. Hmmmm. Maybe other three-year-olds are better at following these kind of instructions, but mine just wanted to run and bounce. And that’s all that they did. After that went on for about 20 minutes, we moved to a room with different stations set up. We all sat on the floor and “stretched” first. This part was actually OK because it was geared towards toddlers. They pretended we were making cupcakes or pizza while stretching out legs. Then, it was time for the stations. The teacher went around and described what they should do at each one. She would then just stand in the middle, and we were supposed to instruct our children on what to do. Sometimes, she would send one of her girls to help spot them. Terrific. I wanted to remind her every day that they are three, and that I am not a gymnastics teacher, but by that point I just didn’t have the energy. I could totally understand these complicated activities if we were training to be on a gymnastics team, but we were there for fun. On the first day, there was one other little boy. He never came back. I’m guessing either his mom felt the same way I did about some of the things I mentioned or else my twins scared her. I’ve told you about their screaming, right? Well, when things weren’t going their way in the class, they screamed. Or ran. Or ran and screamed. I tried my hardest to quiet them down and to corral them into the place we were supposed to be. That’s all I have to say about that. Anyways, I was hoping that even if the activities weren’t the best, at least we would meet other kids and interact with others. Unfortunately, that didn’t happen since there wasn’t anyone else in our class. Overall, even though it wasn’t the best experience, I’m still glad we did it. We all learned a lot, even if it wasn’t what we were supposed to be learning. For example, I learned we need to work on our listening skills. I also need to work on my reading skills, so I will know what I’m getting into next time I sign up for a class. Also, I learned that we are not going to be on a gymnastics team anytime soon. Or ever. 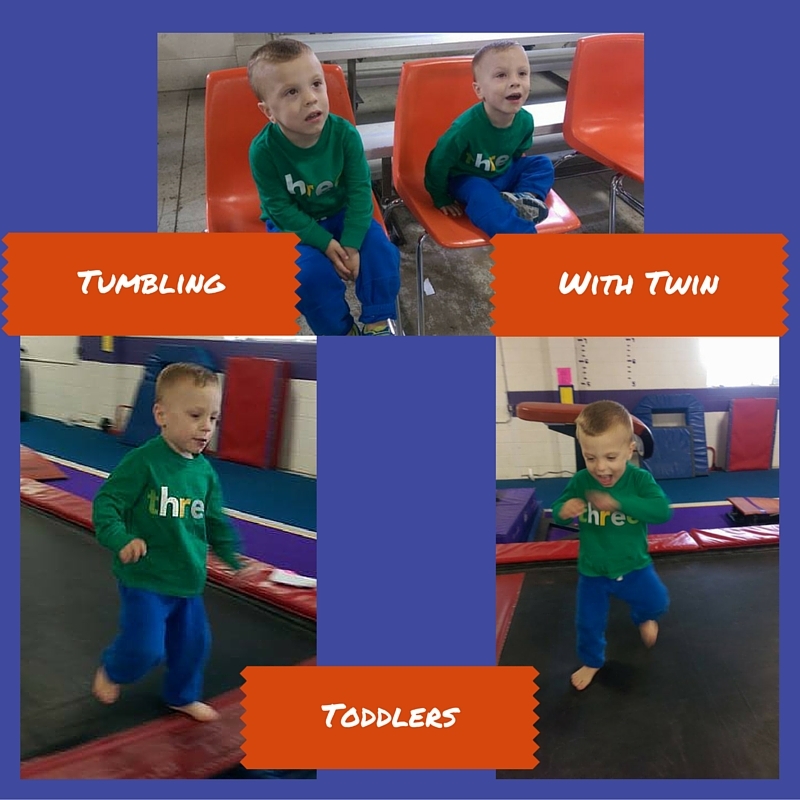 My son loved his tumbling lessons. We did trampoline tumbling. I think he was in the class for about a year before I pulled him out of it. I had some of the same experiences as you it seems. Oh wow Shann! I do not know how you do it! You had me laughing when you said… “Anyways, I was hoping that even if the activities weren’t the best, at least we would meet other kids and interact with others. Unfortunately, that didn’t happen since there wasn’t anyone else in our class.” I do not know why I thought that was funny. This was a good experience for your boys, I hope it does not discourage you to have them join other activities. On the plus side all little kids act a bit wild…trust me, I have one that acts wild and throws tantrums on the daily, but that is just who SHE is. Yes, I said SHE. Oh, I cannot stand it when teachers or volunteers sign up to host/teach a class and they do not care to be there. It irritates me. Thanks Jessica! I’m glad you were laughing…I laughed through most of the classes. It definitely won’t discourage me, but I think we will try something a little different next time. Sorry you have a little wild one too…I thought it was just my boys. It’s hard, but they are fun too, as I’m sure so is your daughter. Sometimes you just have to dive in and see what happens at these classes. My thought for you would be to try not to judge the entire program on one class. You might have a totally different experience if you took another one. You might not, but then you would definitely know. Our YMCA has gymnastics we’ve tried and now my daughter goes to a private gym for gymnastics. They are all different and I’ve learned it can be totally different from one class to the next. Looks like you learned a lot though about what you liked and didn’t from just this one experience! That in it’s self is always helpful! You are wonderful for managing so well. Keep it up! Wow, that sounds pretty intensive for 3 year olds! I can’t even do all those things haha. sorry you didn’t love it. My DH just got a severe sprain last week on a trampoline – so i am not a huge fan either. Oh no! I hope he’s OK.
loved reading your post. I also have twin boys. They are 24 years old now. But I remember the days trying to find some things they would love to do. I tried tumbling also and well mine was just no way. Ha! That’s so cool to hear your boys are 24. I hope they are doing well! Brave woman! My daughter was in gymnastics for a few months and loved it, but the sickness was insane, especially for my toddler (who was also a preemie). Oh no! I’m so sorry to hear that. That is what I’m always afraid of! I LOVED tumbling when I was their age. I did it for years. Great way for them to burn off energy, too! Yes! I think it works out better if they are a little older. We have a similar thing called kinder gym. My wee boy started at 18 months and loves it. Can’t imagine keeping an eye on twins though! That stinks that you didn’t have a good experience! I really like gymnastics when I was little, but this sounds intense for toddlers! I know! I had such fond memories too! I don’t remember taking a class known as tumbling as a kid. It sounds fun, but I feel bad for how you guys were treated. If you were the only ones in the class certainly the teacher could have spent a ton of time with your family. From your description of her, and then of the woman who filled in for her, it is very clear as to which one of them truly loves their work, and which one is just there for the money. Oh how fun! For all of you! Hope it improves – my older kids did something like this and they loved it, so it should have potential! Yes, I think it will. My oldest loved it too. That sounds like an awful class. My kids classes were not like this at all. I guess the gymnastic’s center does have a bit of a scent, but not that I really notice. Our teachers have been amazing and the woman who coaches the independent 2-year-old class is so amazing I cannot even say. I hope next time you find a better class with a teacher who cares. My son (8 months) is also in gymnastics and his coach carries him around more than I do most of the time! So lovely twin boy ! sport class is a must for child, just be careful for safety , because trampoline sometime is not safe . You are such an awesome, Mom!!! that’s all that I can say looking at these pics and reading this. We’ll probably try somewhere else next summer when they are a little older. Thanks! I am glad that they got over their fear of the trampoline. It can be so much fun. My Twins are going to be one this Sunday and I haven’t thought about how we’ll do activities when they get older. We don’t have a support system where so I’ll help you with finding a solution. Wow, swimming classes and tumbling lessons for kids that young are remarkable. I wish my parents also enrolled us to those so we would develop skills that we can take advantage of as we grow up. Now I’m afraid to swim in deep water. It’s okay to try things for your kids, but if it’s that bad then just thank them for the experience. Lol. I hate it when classes are unorganized. I’m glad I’m not the only one with a screamer 🙂 Thank you for stopping by! I’ve found that same smell to be a part of pretty much every gym I’ve ever been to. Not enjoyable, but I can usually block it out in a few minutes. I’m glad there were some positives to the experience though. This is a great, and hilarious post. I totally agree with you that little kids gymnastics classes are way too advanced! I remember taking one when I was a kid and I was supposed to actually do things but I just jumped into the foam pit over and over. Haha! Your boys are adorable! Ha! Too funny. Thank you! I really enjoyed reading your post and your twins are adorable! You are managing well the 2 little cuties!